I recently came across someone on the Internet who said that he was happy reading his newspapers on the Kindle because it was a quieter experience, sans the crackling and folding of paper. He claimed it was ‘easier on the arms’, and ideal for reading in bed. I suppose that logic makes sense in a world increasingly obsessed with ownership and comfort. We’ve slowly begun to move away from libraries. Not academically perhaps, but definitely the readers of novels and poetry have easier resources to dig into. Online journals, e-versions of newspapers and magazines, and blogs have changed the way we read. And write, perhaps. In a world where most things are ephemeral, an experience that has more real life quality to it has a greater chance of lasting. Photograph from Flickr. To tell the truth, I haven’t read the hard copy of a newspaper in a long time. Or bought a magazine. But in a losing battle to electronic media, the one thing I haven’t really considered giving up on is books. I still buy one or two in a month, I still get a kick out of the few times a year I invest in a hardbound edition of a book rather than the paperback. I’ve read maybe two books online, but I do peruse a great deal of poetry on the ‘net. I’m not going to over-romanticise the experience of reading and say that I’ll miss the sound of turning pages, the weight of a book in my hands, and the feel of actual pages between my fingers. Even though I will, a little. But what I will miss is imprints. Flipkart may mean I order online sometimes instead of physically visiting a store, but it doesn’t completely negate the experience. What does a book come to entail? For every visit to the bookstore that I buy a book, there are five visits where I just browse. And I assume this denominator is greater in the cases of many people who aren’t impulsive shoppers like me. And the book is yours. A cuboid of space that’s yours. I suppose you can say the same for the Kindle, but there’s a world of difference. If a few clicks and a ka-ching later, a book-length Microsoft Word document was sent to me, I’m not sure how I’d feel. Suddenly you’re carrying the experience with you, and you no longer have the need to go anywhere. Sickly sweet as that may sound as an argument, in a world where most things are ephemeral, an experience that has more real life quality to it has a greater chance of lasting. I’d rather come home to a library, than carry one with me. Not that I haven’t done a good deal of reading out of libraries. Something the Kindle can’t replicate is that every bookstore, secondhand establishment, and library is somebody’s collection. Someone, or is more often the case, some people, and usually over time, put these books together, this selection rather than others. This negotiation of inclusion and exclusion creates an irreplaceable experience. This is especially true with secondhand bookstores. I’ve found the strangest things in their chaos. Strange and memorable, and sometimes bizarre, but never forgettable. If I give in to buying a Kindle, which I sometimes am in danger of, I lose out on the search that I’ve loved my whole life. These books say so much about their previous owners, and about surviving, and on my cornier days, about the power of chance. Books are like chance encounters, when not hearsay. Though a Kindle allows you to make notes, there are older forms of impression it is incapable of absorbing. 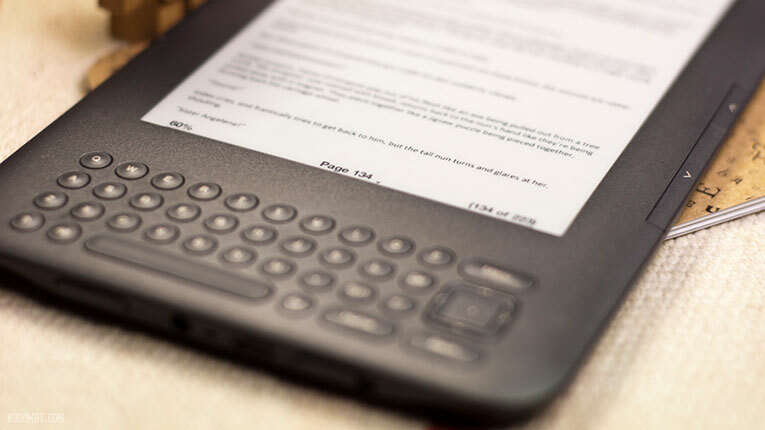 Can you make an e-book age? Don’t answer that please—I’m sure technology can tether frayed edges to the pages and coffee-tone the words. But I could as easily achieve that in a click as through years of actual existence. I know change is necessary, and that change will come, but it’s because everything has the potential to shift that I’d like to hold on to something real. I’m considering getting a Kindle simply because of the sheer amount of reading material that many sites and online magazines release for free. Urvashi, the write up is really good and honest. You sure have a way with words. Keep it up.